What I specifically like about Parse – it has great user management functionality in built and available out of the box. Client applications can register new users and then log them in with only 2 API requests. First we are going to register new user. Parse is asking client applications to send Application Id and API key in the HTTP headers. This information you can retrieve from Parse API reference documentation page. It should have your credential details pre filled in example requests. Username has to be unique in the User database and Parse has inbuilt validation for this (try to create another user with the same name and you will get “username already taken” error. After our new user is successfully created some time latter our mobile application can make another request with user login data in order to login. Parse will handle username / password validation steps and will issue session token with user details if login was successful. 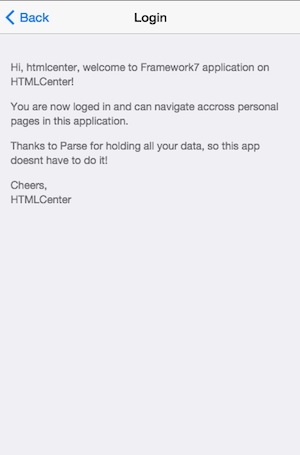 In case login data is incorrect your application will receive appropriate response from Parse service. As you can see all user management functionality is already provided for our mobile application by Parse without us doing much work. We do not have to store any user related data in mobile web app (not recommended for security reasons). Our client application will only have registration and login forms for app user to submit data. Here is how registered user data looks in Parse cloud service – via web UI. Next step is to enable login and registration views. Framework7 doesn’t use any external 3rd party libraries. In their applications developers can use jQuery like syntax for accessing DOM and jQuery Ajax syntax to send / receive requests via HTTP. In this tutorial part we continue using source code from where we left it the previous tutorial part. I have added another page called register by simply copying login page HTML code and renaming data-page attribute. This page has 3 fields we are going to be sending to Parse: username, password and email. In order to login, user will need only username and password but our application could retrieve users email anytime by requesting information from Parse. This above peace of code captures values from registration form and assigns them to variables to be used in the HTTP request. Code also checks for these fields not to be empty and displays simple alert message if any one of them is missing data. 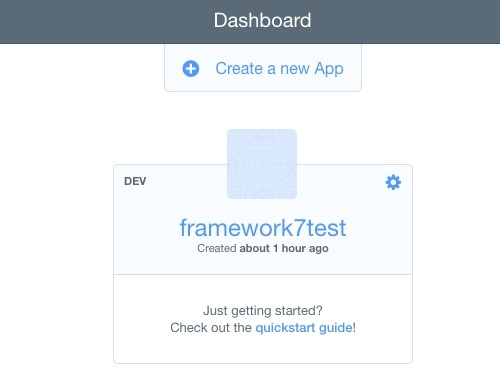 Note the myApp.alert in the code – it will display nice iOS7 like popup message. As you can see, we are setting query url, JSON object to be posted to Parse and initialising Framework7 spinner before making Ajax request. In both cases we are dismissing spinner. 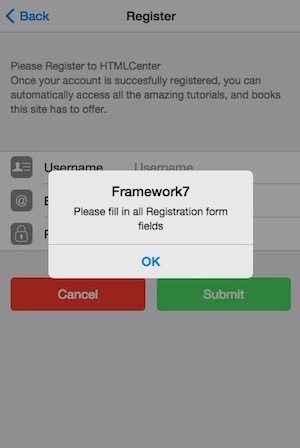 In case user registration was successful we are loading up welcome page from Framework7 template. If registration for some reason was not successful, we are going display already familiar Framework7 popup message about unsuccessful registration. Worth to mention that it would be possible to verify more details about why the registration request has failed as Parse actually sends informative response message. But we are going to do it in 3rd tutorial part. In the final 3rd part of the tutorial we are going to wrap up this application to PhoneGap framework which will make it a native mobile app. Stay tuned for the last tutorial part. I love the tut, however, I am struggling to get it to work with classes like blog in parse. I want to display posts from my class “blog”. So you have class in Parse called ‘blog’ and struggling to get data out? any specific errors? Great Post ! HTML5 tutorial with simple and easy examples, Covering HTML5 Introduction, Semantic Elements,Attributes,Multimedia,Video,Audio,Plug-ins,YouTube Videos, Geolocation, Drag and Drop, Local Storage, Coding Conventions / Style Guide. HTML5 Tutorial & CSS3 Tutorial. Hi, Is there any option to use Angular like services in Framework7. I want to create a Mediaplayer app which will be available across all pages. ok. Finally I integrated angular with Framework7 and it is working fine. Great insight! Happy to read this post. How does one properly view the work that they have created? I have no web host or anything that I can use to upload these files to for testing. I have created a php registration and login form need to integrate in backend using Framework7. I dont know can anyone help me please. Please advise if you got it sorted out, as I’ve been stuck for over a week now. What exactly you are stuck with? I’m trying to create a login & registeration page using framework 7, and need some guidance on how to create a php api that could be used in ajax in framework7,,,I’m able to achieve this using php only but not ajax,,,please advise how to accomplish this with framework 7.